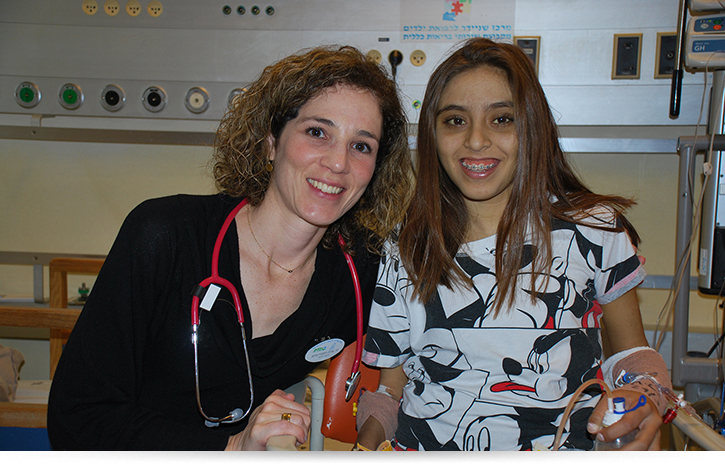 Hila Amram, 13½, from Beer Tuvia, suffered from two diseases - a congenital disorder called biliary atresia (blocked bile ducts that caused liver dysfunction), and diabetes. Due to the deterioration of her liver which led to liver failure, combined with diabetes, she had to undergo dual organ transplants to save her life. This was a rare step which not only saved Hila’s life, but also relieved her of her dependence on insulin. Over and above the procedure, the internal organs of the donor were found in reverse order of their normal location, in itself a rare situation that demanded high aptitude and skill. Following the operation, Hila was transferred to the Pediatric Intensive Care Unit for recovery. Immediately following the liver and pancreas transplant, another operation ensued of a kidney transplant in an 8-year-old girl who suffered from congenital renal failure. She had been treated in the Dialysis Unit and had been waiting for an organ for close to a year. During the month of March 2019, Schneider Children’s conducted 9 organ transplants in children aged 9 months to 13½ years including a heart, liver and pancreas, 2 liver lobes and 5 kidneys. The liver and kidney transplants were performed by Dr. Michael Gurewitz and Dr. Sigal Eisner, senior transplant surgeons in the Organ Transplantation Department at Schneider Children’s. In order to conduct liver, pancreas and kidney transplants, which are already complex operations, and even more complicated when small children are involved, special preparedness of multidisciplinary teams is essential. The teams comprise transplant surgeons, ultrasound technicians, gastroenterologists, nephrologists, transplant coordinators, social workers, dieticians, dialysis teams, anesthetists and surgical nurses, intensivists, transplant specialists from Pediatric C and more, all highly experienced in their fields. Schneider Children’s conducts the majority of organ transplants in children’s in Israel and among one of the few hospitals in the world that can perform several organ transplantations at the same time. Since its inception, more than 600 transplants of heart, lung, lifer, and kidney have been conducted in infants, children and adolescents with a rate of success comparable to leading institutions in the world.